Baking with kids can be lots of fun and rather messy! But among all the mess, there are so many benefits that kids gain from the whole baking experience. This article looks specifically at some of the ways a child's school skills can benefit from the whole baking experience. In addition, don't forget how special it can be for a child to spend time creating memories with a caring adult. Try Some Great Cookie Recipes! Developing good bilateral coordination skills can help children to tie shoelaces, cut with scissors and draw a line with a ruler. 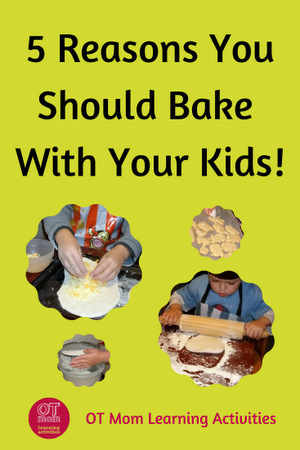 Baking can give your child lots of opportunity to develop and use the hands in a coordinated way. Rolling balls of dough, rolling out dough with a rolling pin, and flattening dough with the hands are all great ways of letting kids practice their bilateral coordination skills. Sifting flour into a large bowl is also a good bilateral activity: it trains a child to use one hand to “support” while the other does the heavy work. 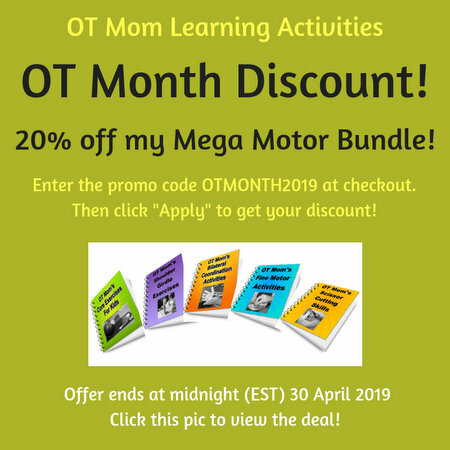 If your child needs more practice with bilateral skills, try my other bilateral coordination activities. Pouring ingredients into bowls and jugs, and pouring batter into tins are all good ways for kids to practice their eye-hand coordination. Decorating cookies with icing on cookies or putting frosting on cupcakes also uses eye-hand coordination. If your child struggles with these tasks, try some of these eye-hand coordination activities. If your child is very wobbly when pouring, and struggles to pour with good control, you might want to work a bit on shoulder girdle stability to help improve those skills. Baking with kids can give them lots of opportunities to strengthen their hand and finger muscles. In the pics above, you can see how squeezing dough into balls gets the hands working. Even sprinkling cheese on pizza bases can give the fingers a workout! Homemade icing bags are super-easy to make and make a great hand exercise for your child. They are the easiest way to let a group of kids ice their own cookies with the minimum of mess and with far fewer broken cookies. Make a basic glaze icing from icing sugar and a tiny bit of water - just enough to make a smooth paste without being too runny. Place one or 2 tablespoons into the corner of a small plastic baggie, tie a knot in the bag and then snip off the corner. Your child can then squeeze the bag to get the icing out onto the cookies. Depending on hand strength, you can let your child use one hand, both hands or even the tripod fingers. if your child's hands are very weak, try some of my hand strengthening activities. There should always be a recipe involved when baking with kids! Whether they read the recipe themselves (in words or in pictures) or follow your verbal instructions, following a recipe can boost your child's listening and sequencing skills. Following instructions is an important school skill, and baking can give your child lots of practice in this. Helping your child to organize him/herself in the kitchen and clearing up messes is also a helpful life-skill. Help your child take dirty dishes to the sink and "clean up as you go" , and then remember to pack all the ingredients away afterwards! Spatial perception and planning skills are also boosted when your child has to cut out cookies. Challenge your child to get as many cookies as possible from single roll-out of the dough - this will challenge your child to place the cookie cutters in a way that minimizes waste. Doing Math While Baking With Kids! Letting your kids bake with you will help them learn about measuring and about number concepts in real life. Let them count out eggs and cups of flour. Let them measure liquids and use measuring spoons, and just expose them to the concepts of math in real life. You might even manage to get some skip counting done! I let my kids skip count while the beater is running! These are my kids' favorite cookie recipes - they give lots of opportunity to include some or all of the skills mentioned above. So grab an apron and get baking! With kids, things can get a little messy, but persevere and the mess gets less as they develop their skills. It does help if you have a nice covered outdoor area, where your kids can mix the ingredients on a table! But really, truly, the fun they will have, and the skills they learn, far outweigh the temporary mess! These delicious crunchy cookies are full of different breakfast cereals and use the creaming method. Your child will able to measure out & add the cups of dry ingredients, sift the flour and roll the mixture into balls to place on the tray. This a cookie dough recipe which needs to rest in the fridge for an hour before rolling out and cutting the shapes. Your child will be able to measure out & add the cups of dry ingredients, sift the flour, roll out the dough, cut the cookies and ice them afterwards. For your convenience, I have linked to these products on Amazon - I receive a small commission if you purchase something through these links, which helps support this site. However, you are under no obligation to purchase anything! If the images are not showing, your browser may be blocking the image ads, but the links should still work.